If you enable DMR Simple mode you do not require a codeplug in your radio apart from Talk Group 9, Colour code 1. 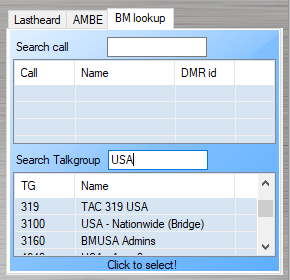 Enable DMR Simple mode on the AMBE Tab then enter the Talk Group you want to use – e.g. 3100 USA – Nationwide then press the PTT on your radio to talk. Another way you can search for a Talk Group is by selecting the BM Look Up tab and entering the Talk Group in the “Search Talk Group” Field. Select TG319 USA which will auto select it on the AMBE Tab. Press PTT on your radio and you will go out on TG319. 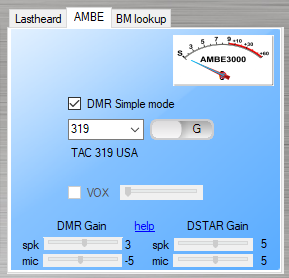 The AMBE ( DMR/DSTAR ) Gain is to control the gain in the AMBE chip. Make sure the speaker volume of the soundcard is correct before tuning the skp AMBE gain! Make sure your microphone volume in Windows is at 100% before tuning the mic AMBE Gain!